Hello, my name is P.J. Simmons, and I’m a Tennisaholic. By day I work on environmental issues (I chair the Corporate Eco Forum), but by night — and weekend and every spare moment possible– I play tennis. 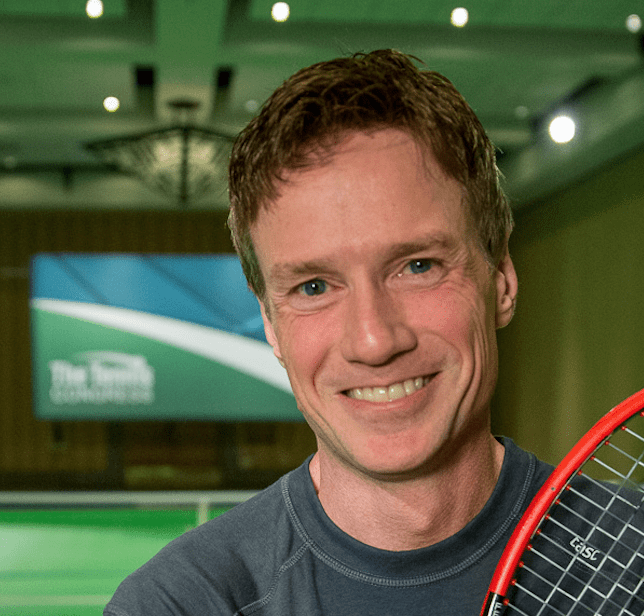 I’m also the founder of the The Tennis Congress, which I launched in 2013 as a means to give amateur tennis addicts like me access to pro-quality training with the world’s best teaching talent. So I’ve been investing a huge amount of time and money in my tennis education (clinics, privates, teams, online tools). So much so, in fact, that tennis is currently my sole “retirement fund”: I’m betting that my investments in training today will generate priceless dividends in the form of happiness and health down the road. Given the incredible amount I’m learning from amazing coaches and trainers, it occurred to me in summer 2012 that I might be able to help others with a similar drive to improve if I started documenting lessons learned (and frustrations) on my own journey. There’s no question I’ll learn a ton from the process of putting stuff down on paper (and video)– but it’s my sincere hope that sharing some of my own epiphanies and experiences will help others wanting to fast-track their own improvement. I also hope my posts help coaches on the lookout for new ways to explain things to students and help them break through to the next level. Full disclaimer: I am a student of the game, not a teaching pro— so fellow students are strongly advised to dive into many of the professional sites I’ll recommend on this blog for a far more comprehensive set of time-tested tools and strategies. My goal here is to add insights from a student’s perspective in ways that complement to all the great professional sites already out there. Some of my favorites include Jeff Salzenstein’s Total Tennis Training, John Yandell’s TennisPlayer.net, Will Hamilton’s Fuzzy Yellow Balls, Ian Westermann’s Essential Tennis, Craig O’Shannessy’s Brain Game Tennis, Jeff Greenwald’s Fearless Tennis, Florian Meier’s OnlineTennisInstruction, Clay Ballard’s TopSpeed Tennis, Bill and Matt Previdi’s The Previdi System, and TennisResources.com. From a tennis fitness perspective, however, I have worked hard to become an expert on the kind of fitness training tennis players need– especially competitive adult recreational players– to enhance performance on court and ward off injuries well into our “golden years.” In my 20s I was a certified fitness instructor and have since achieved Personal Trainer certifications from the International Sports Sciences Association (ISSA) and American Council on Exercise (ACE), as well becoming an ISSA-certified “Specialist in Fitness Nutrition.” I’m also an iTPA Certified Tennis Performance Specialist — the gold standard certification for fitness training in the tennis industry. 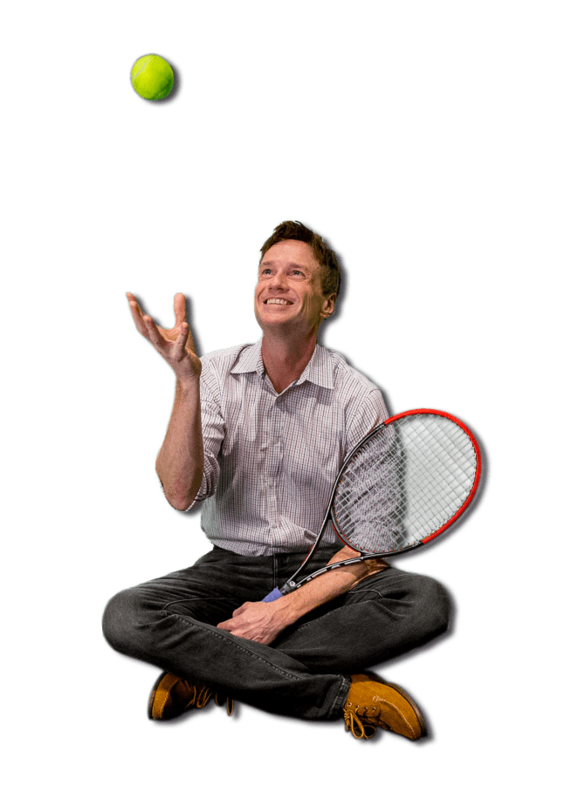 I pursued these certifications both to be more empowered to create sound training regimens for myself and to stay at the cutting edge in helping design the curriculum for The Tennis Congress. Everything changed in 2008 when I moved to New York City to a building literally across the street from the Manhattan Plaza Racquet Club. I signed up for an advanced beginner’s clinic and I was hooked. Thanks to the encouragement of a great pro named Bruce Barney, I kept coming back about once a week. Within a year it was twice a week. By 2011, I was playing 3-4 times a week and going upstate for a weekend once a month to train at what became my “home away from home”: Total Tennis. In spring 2012, I captained my first USTA Men’s team. Today I’m closing in on 4.0 level, but my real sights are set on getting to 4.5 within a few years. When I launched this blog one of my first coaches, Tumeka Harris, yelled at me for not naming this blog the “Road to 5.0 Tennis” because that’s what she thinks I’m capable of achieving in the next 5 years. I hope she’s right, and I’ll certainly work towards that. But for now, I’m keeping my eye on the 4.5 ball, which is no doubt several years of hard work away. In the meantime, I look forward to sharing everything I learn in the process of getting there. I do not accept any paid advertising or direct payment to promote anything on this site. Any recommendations for products or websites are based entirely on genuine enthusiasm based on my own personal experience. However, at the strong urging of one of my online-savvy tennis friends (who knows how much money I spend on tennis), I recently added “affiliate links” for certain things I was already recommending (e.g. books I love, tools I’ve used to help avoid tennis injuries, or ticket sites I used for tennis events). If you buy something through one of these links you won’t pay a penny more, but I’ll get a small commission from Amazon.com or other affiliate websites– which, in turn, helps support my tennis training and the Tennis Congress, a passion project I do on the side of my regular job. I appreciate the support!